The Art of Living says the event has got all necessary permission from the government. 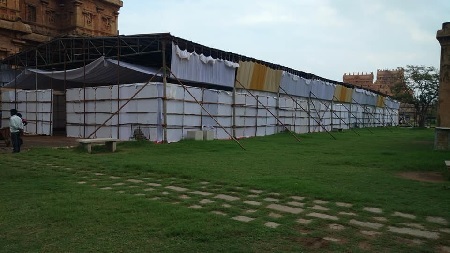 An enormous temporary structure which has been set up in the 25 acre Brihadisvara temple in Tamil Nadu's Thanjavur district has irked a section of residents, political parties and heritage enthusiasts in the state. The structure on the temple lands which has been declared as a UNESCO world heritage sight, has been built to host a two day event being conducted by Sri Sri Ravishankar's Art of Living Foundation. 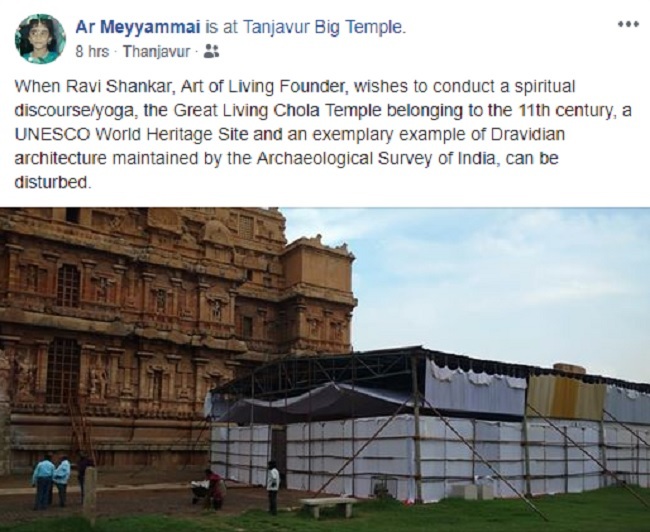 Pictures put up journalist Ar Meyyammai, who visited the temple, show that the pandal which begins from one side of the temple stretches onto the lawn adjoining it. The 11th century Shiva temple is classified by UNESCO as one of the 'Great Living Chola Temples'. It has been under the protection of the Archaeological Survey of India from 1922. Sources in the temple tell TNM that setting up a structure disrupting the path taken by devotees to pray is disrepectful to the place of worship. The ASI however maintains, that Art of Living received the required permission to conduct the event at the site. "It is only a temporary pandal for an event to be held from December 7th to 8th. It will be removed on 8th evening. They have got all permissions necessary from the Chennai office," says an ASI official in Thanjavur who is monitoring the event. "Thanjavur is apparently the guruji's native place and so he wanted to hold the event here. If any part of the structure is in contact with the temple we will have it removed. This is not the first time that pandals are being set up at the temple. I don't see why this has become a controversy," he adds. A priest from the temple however tells TNM that the temporary structures set up in the temple before this were much smaller, did not hinder the path of devotees and were for events connected to the temple. "Giving away temple lands for a private event is unprecedented in my 20 years of service here. It is very wrong and we don't know how they got permission," says the priest. "The only time we set up small sheds was during the Raja Raja Chozhan festival which is in homage to the King Raja Raja Chozhan who inaugurated it. These people have blocked one side," he adds. According to the Art of Living, the event is focused around the discourse of Kashmiri Shaivism and all necessary permission has been taken for the event. Well known historian V Sriram questions why permission is being given for events at a recognised heritage sight. This is not the first time, an event organised by AOL foundation has raised eyebrows due to the venue chosen. In 2016, the National Green Tribunal slapped a fine of Rs 5 crore on the foundation over damages to the environment caused by the controversial World Culture Festival which was held on the banks of Yamuna in New Delhi. An expert committee set up by the government in 2017 stated that the event had completely destroyed the floodplain and that it would take 10 years to restore it. Despite the backlash from environmentalists, Prime Minister Narendra Modi had attended the event and heaped praised on the spiritual leader.